This book, written by Jose Luis Lopez and published by AMMO, features a technique he invented and has made very popular by modellers recently. It’s quite a divider of the room, and it is at it is best well done and it makes a model great looking while at its worst it is overdone and cries of “Spanish School” by people who just don’t think too hard before they talk (I am sure not all Spanish models look the same so stop generalizing.) Jose Luis Lopez is here in print to explain to you how to do this at its best. 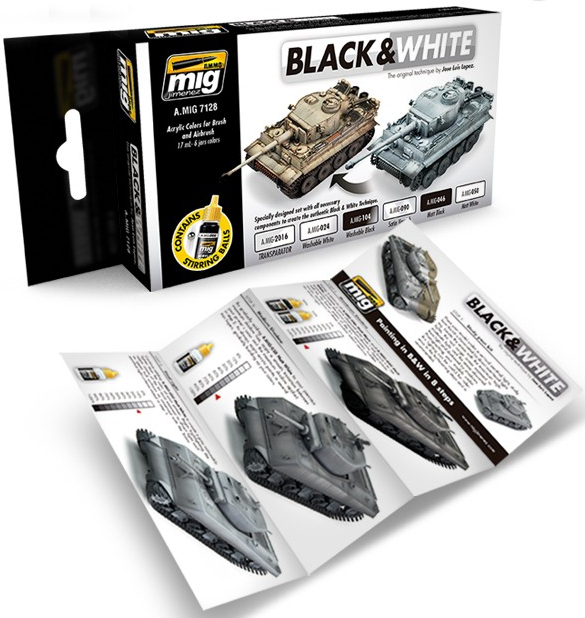 This is a book focussed as I said on the one subject – that of light and dark shades of tanks and AFV’s and the use of black and white (or shades of grey to be more precise) to shade your model to make it more realistic to the human eye. Jose Luis Lopez’s book is written in English and although it’s an easy read it is also relatively short at 100 pages which cuts out a lot of boredom and repetition. While a lot of this book is going through the theory, the other half is the practical and from reading it it’s just about enough on that one subject and its variations for my liking. The author begins the book by giving his thought on his modelling technique and his initial thoughts on the black and white method of undercoating and then shading your kits. The positioning of lights and the angles the subject is viewed in are a major part of this technique. We see many examples of how light hits objects and how the shadows make the colours of the objects differ rather than just adding a black to darken and a white or yellow to lighten. Also the need to carefully choose just how dark your base needs to be is determined by the final colours on the kit is explained. We look at colours and colour wheels with objects like tanks shown in light and shade to give examples. We look at both soft edge and hard edged effects on your base colour, and then step by step through ten very helpful pointers or rules if you like which will help your model along. The author talks about “Ecosystems” in his work a little like a natural flow of things, and the need not to overload your model with detail but to place artefacts in the right places and for a reason – it makes perfect sense to me. Next we have three pages that are a bit of an advert for the AMMO brand Black & White Technique Set. Developed for just this effect it consists of six paints with a Black & White technique leaflet. I suppose that if you just wanted the basics without all of the theory showing you the same thing on many applications this set is for those who know how to do this without the book. The paints were made to replicate the effect in the book. I would like to see other paints used every now and then but I understand why this is in here. The next section starts to get a little more practical with applying the technique to several AFV’s of different types, shapes and final hues. Curvy Shermans, WWI MK IV’s, WWII 8-Rads, JS II’s and Tiger I’s are all shown before our buddy Iain Hamilton shows you his own go at a Humvee. All of these different shaped and era vehicles are shown from start to finish, how to add wear, accessories and dirt. Chapter six sees order brought to the house. We look at this technique in a summary chart. This shows you the steps you need to take. It’s almost the two most important pages of the whole book for mine and it stitches up the rest of the book rather well. A very handy book to have and I have not seen a better explanation of the Black & White Technique. It’s a very good toll for all modellers not just armour guys and I like the author’s passion and writing.